I suppose it's only natural to pause and entertain a few "loftier than usual thoughts" as one year ends and another begins. A fresh year brings out that sort of stuff. For me, at year's end, I ponder how quickly it went by. Either my calendar is missing a few months, or I'm living in some kind of time warp. Or, whether the cosmic aberration is happening now, and those long seasons of youth were the real measure of time, and -- right now -- by some force of nature, all the clocks have speeded up. As a child, three months of summer vacation seemed to go on and on.... offering as many unhurried options and possibilities as my imagination could conjure up. Nowadays, it seems to me, three months can pass while I'm waiting in line to have my car emissions tested. And leftovers in the refrigerator are -- I figure -- still eatable after three months. As for New Year's Eve, I'll admit it's never really been a big deal to me. I don't care for the celebration and forced frivolity. I like it best when I stay home and hardly notice the midnight hour. There have been some exceptions. One year, Karen and I were hopelessly stalled in traffic on our way to meet some friends to ring out the old. We were late arriving, and we brought in the New Year while in the process of parking the car. Oddly, it's one of my favorite and most vivid New Year's memories. Another nice New Year's Eve was 3 or 4 years ago when Garrison Keillor broadcast a special late night Prairie Home Companion from the Ryman. As you might expect, Garrison was low key and understated at the stroke of midnight, and I liked that. And on New Year's Eve 1989, Karen and I were in Annapolis, Maryland where I served as Best Man for my pal Pat Sajak in his marriage to Lesly Brown. That was a fun and memorable night. Hey, Pat and Lesly, if you're reading this.... happy 15th anniversary!! Anyway, here we go into 2005. It'll mark 10 years since I returned to the anchor desk at WSMV. 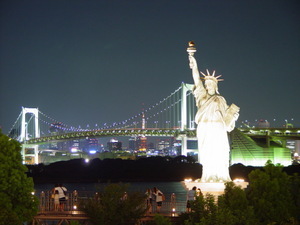 And, it'll mark 5 years since Bill, Rudy and I sat frozen on the rooftop of the Big River Grill downtown -- while Demetria was being trampled inside the arena -- as we all broadcast the arrival of the new millennium. Hard to believe it's already been 5 years since that night! I wonder if it's OK to get rid of all that bottled water now? Is the Y2K stuff over with? I believe it's easier to grieve for one death than for tens of thousands. The death toll in southern Asia is so massive, so unimaginable, so incomprehensible, that it simply cannot be grasped. It becomes almost abstract. Somehow, it seems the human mind is protected from being emotionally overwhelmed by such a thing. But tonight in New York City, the marquee lights of Broadway will be dimmed for one minute at curtain time, to honor one man.... a man whose face we know well.... actor Jerry Orbach. Orbach died Tuesday night of prostate cancer. 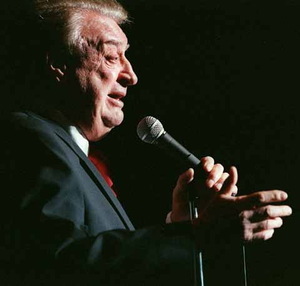 Jerry Orbach had years of success on Broadway, in the movies, and on television. 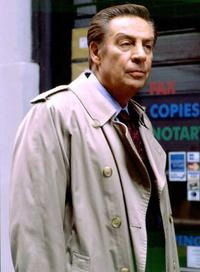 His tough, craggy and compassionate character, detective Lennie Briscoe on Law & Order, was as real to the audience as any character ever created for a TV series. He once said, "I don't know where I stop and Lennie starts, really." Yet, his range as a performer went far beyond Briscoe. Did you know he was the voice of the candlestick in the animated movie "Beauty and the Beast"? And he sang "Be Our Guest" in that movie. He was a real and vulnerable human being. Even after all the years of success in every entertainment medium, Orbach never felt secure. After landing his successful role on Law & Order, he said, "All my life, since I was 16, I've been wondering where the next job was gonna come from. Now, I take the summer off, relax, and I know that at the end of July we're gonna start another season." You'll still see Orbach in a few episodes he's already filmed for this season, but when they start again next year -- this time, he won't be there. Jerry Orbach was 69 years old. Well, it wasn't exactly 'new fallen snow' we had on Christmas eve around Nashville. It was, instead, newly formed, crunchy ice across lawns and fields. And I hope you saw the magic. Around 10:00 or 11:00 Friday night, with the full moon overhead, if you walked across the frozen grass, you probably saw it. Glistening ice, laced with sparkling diamonds. It was like walking over stars. I don't remember seeing anything quite like it before.... especially on a Christmas eve. As we walked to our car after gathering with relatives, I kept thinking about the words, "the moon on the breast of the new fallen snow, gave the lustre of midday to objects below." And as I walked, I kept checking the sky..... for a few magical moments, I forgot about being a grownup and thought -- maybe, just maybe -- I'll see Santa flying overhead. It was already late, and my six year old was staying up far longer than she should've, and I told her I'd lie in bed with her for a few minutes. She reminded me that we had forgotten to leave out cookies and milk for Santa. I assured her that her Mother and I would take care of it. We quietly whispered as much of "Twas The Night Before Christmas" as I could recall -- and then, in silence, we listened for any sound that might be Santa and his team of reindeer. While we listened, I looked over, and she was asleep. It's amazing how such a little person can bring so much delight to a big, busy night. And the words our family had heard earlier in the evening, when a group of carolers stood outside our front door, came to mind..... words about a silent night, and how "all is calm, all is bright". Christmas morning, it was obvious that Santa had enjoyed the cookies and milk. This year, as every year, the gifts of the season are so much more than the packages exchanged around the Christmas tree. It's the little ordinary things that are the real gifts. I hope that Christmas, or Hanukkah, or whatever you celebrate this time of year, was an enchanting time at your home. I always imagined that Francis P. Church looked something like Ed Asner (aka Lou Grant), a crusty, somewhat disheveled, typical newspaper editor. But as you can see from the attached photo, that's not the case. He looks more like a character from Mayberry. 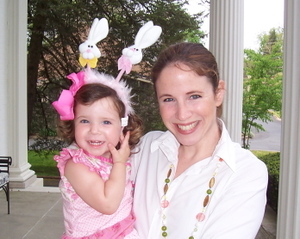 On the other hand, Virginia O'Hanlon looks about like I thought.... a lovely, sweet little girl. You know the connection between these two. It was 1897, and -- as kids often do -- eight-year old Virginia was having some doubts about the reality of Santa Claus. Her father, a doctor in New York City -- perhaps as a way to avoid answering a clumsy question -- suggested she write to the newspaper and ask them. She did.... and the answer became the most widely reproduced newspaper editorial in history. Her question was answered by Francis Church on September 21, 1897. He'd been with the New York Sun for about 20 years, and was working as an editorial writer. Before working for the Sun, he had been a Civil War correspondent for the New York Times. 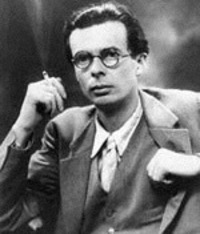 When he joined the Sun, he served primarily as a writer specializing in theological and controversial subjects. Church got married shortly after his editorial was published, and he died in 1906. He never had children, but his words still comfort countless children (and adults) more than a century later. 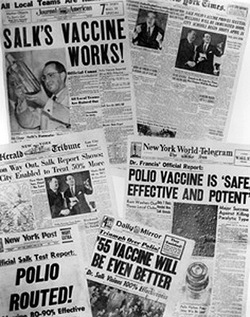 The New York Sun reprinted his editorial every year until it went out of business in 1950. Virginia went on to earn a master's degree from Columbia University and a doctorate from Fordham. She spent almost 50 years working in the New York City school system. Virginia O'Hanlon Douglas died in 1971 at a nursing home in Valatie, New York, at the age of 81. Throughout her life, she received mail about her letter to the editor, and she'd answer them with an attached printed copy of the Francis Church editorial. In the 1940's, speaking before an audience of college students in the 1940's, Virginia talked about what led to writing that letter. She said, "I was an only child, and my parents did everything for me that parents could do. Quite naturally, I believed in Santa Claus, for he had never disappointed me. But like you, I turned to those of my own generation, and so when less fortunate little boys and girls said there wasn't any Santa Claus, I was filled with doubts. I asked my father, and he was a little evasive on the subject." She added, "It was a habit in our family that whenever any doubts came up as to how to pronounce a word, or some question of historical fact was in doubt, we wrote to the 'Question and Answer' column in the New York Sun. Father would always say, 'If you see it in the Sun, it's so,' and that settled the matter." Read it again..... and Merry Christmas. "Dear Editor: I am 8 years old. Some of my little friends say there is no Santa Claus. Papa says, 'If you see it in The Sun, it's so.' Please tell me the truth. Is there a Santa Claus?" They do not believe except they see. They think that nothing can be which is not comprehensible by their little minds. All minds, Virginia, whether they be men's or children's, are little. In this great universe of ours, man is a mere insect, an ant, in his intellect, as compared with the boundless world about him, as measured by the intelligence capable of grasping the whole of truth and knowledge. Yes, Virginia, there is a Santa Claus. He exists as certainly as love and generosity and devotion exist, and you know that they abound and give life its highest beauty and joy. You tear apart the baby's rattle and see what makes the noise inside, but there is a veil covering the unseen world which not the strongest man, nor even the united strength of all the strongest men that ever lived, could tear apart. More than 4,600 DUI arrests in Nashville this year, so far! That's a lot.... and two holiday weekends are still ahead. And keep in mind, that's just the arrests.... who knows how many drunks manage to make it home, or to wherever they're going, without getting arrested, or hurting someone.... this time at least. It's serious business folks. Drunk people, who can't even walk straight, behind the wheels of 3,000 pound vehicles, heading straight toward you, or your child, or your parent, or your friend. The potential for damage and death is mind boggling. Sometimes, we talk about it so much on TV that I fear it becomes little more than background noise on newscasts. There are lots of facts and figures I could throw out. But you know the numbers. Tens of thousands every year, killed, or maimed, or forever impaired by drunk drivers. Billions of dollars spent.... all because people choose to get drunk, and then drive. The jail time, or other punishment, is not what I'm concerned about. That happens after the fact. What I worry about is, somehow, keeping drunks from driving, period. It's as simple as that. After 9/11, we Americans sacrificed our time and convenience at airports and arenas, even when we know we're not a threat. All for the public good. I know I'm not carrying a bomb or a weapon, yet I allow the invasive and thorough check because it might just weed out someone who is. We already have some technology to do it for drunk drivers. For example, those alcohol ignition interlock devices. When someone is caught driving drunk, install one on their car, immediately. Better yet, manufacturers should start installing some kind of device on all cars. Or we could personally install them on cars of people we love. For a fraction of what the government spends on the effects of drunk drivers, we could encourage scientists and inventors to come up with new ways.... keys or key holders, for example, that must get a "clean blow" before they'll start the car. Put the right financial incentive out there, and you'll be amazed at what technology can be developed. The last time I took a flight, right there in front of everybody, I had to take off my shoes and belt, and let a security man pat me down. Surely, in the privacy of my own car, I'd be willing to breathe into a device to "let my vehicle know" that I'm in the proper condition for driving. Our government has spent hundreds of billions of dollars to keep another tragedy like 9/11 from happening again. And rightly so. The 9/11 attacks were even the catalyst for going to war! But every year, drunk drivers are killing around 20,000 people. 20,000 Americans! And hundreds of thousands of people are disabled for life, or suffer devastating injuries. And the cost in dollars is simply incalculable. Maybe it's time this country goes to war against drunk drivers. I'll be disappointed. But that's OK.
67 years ago, Atlanta, Georgia was the show business Capital of the World, at least for one night. And no, I wasn't around yet.... I've just heard the stories. When I was a kid, whenever my family would drive from Augusta to Atlanta (usually on our way to Rome to visit relatives), my parents would always point out two world famous theaters, the Fox and the Loew's Grand. 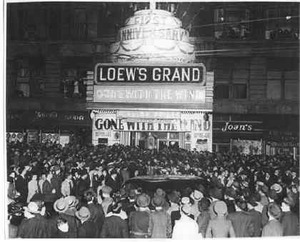 Loew's Grand is gone now, it burned in 1978..... but on December 15, 1939, it was the site of the world premiere of Gone With The Wind. The excitement in Atlanta, I'm told, was beyond belief. Not so much for the movie premiere, but for the movie stars who spent 2 or 3 days wandering around the city. Most of the cast members were there.... Clark Gable, Vivien Leigh, Leslie Howard, Olivia de Havilland and all the rest. Author Margaret Mitchell was there as well. In the days preceding the premiere, Clark Gable and Olivia de Havilland visited around town, forever winning the hearts of Atlantans. They attended the Junior League Ball. Gable supposedly ate turnip greens and cornbread at local restaurants. Together, they visited the Atlanta Cyclorama, a giant painting commissioned in the 1800's, depicting the battle of Atlanta. 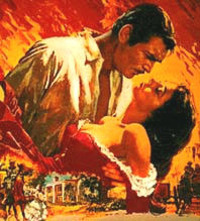 Gable was impressed, but joked to Mayor William Hartsfield that "the only thing missing is a likeness of Rhett Butler." Well, that was all they needed to hear. If you visit the Cyclorama in Atlanta today, the guides will proudly point out a plaster-of-paris mannequin that bears an eerie resemblance to Clark Gable. That star-power is strong stuff. The only surviving member of the main cast is Olivia de Havilland. She's 90 years old now.... living in Paris.... and said to be healthy and sharp-witted. Oddly, hers was the only principal character to die in the movie, but -- in real life -- she's the only one still alive. On the night of the premiere, some 300,000 folks lined Peachtree Street to watch the motorcade of stars heading to, and arriving at, Loew's Grand. Another 2,000 paid $10 each to attend the premiere showing. Noticeably absent from the parade of stars was Hattie McDaniel, the black actress who played Mammy. This was Georgia in the 1930's, and things were different. 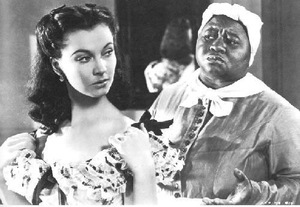 When the Academy Award nominations were announced the next year, both Olivia de Havilland and Hattie McDaniel were up for Best Supporting Actress for their roles in Gone With The Wind. And on the night of the Awards, the surprise winner was Hattie McDaniel, beating out Olivia de Havilland, and becoming the first black performer to claim an Oscar. In an interview in 2004, De Havilland was asked about her feelings, losing to Hattie McDaniel. She said, "Hattie deserved it and she got it. I thought I'd much rather live in a world where a black actress who gave a marvelous performance got the award instead of me. I'd rather live in that kind of world." Even though it's probably overexposed nowadays, I believe "A Christmas Story" has replaced "It's A Wonderful Life" as the quintessential Christmas movie. Several years ago, I absentmindedly introduced my (now) wife to the late Marvin Runyon, saying, "Karen, this is Damon Runyon.... Damon this is Karen". Only later did I realize my mistake, but Marvin never corrected me or mentioned it. In fact, neither of us ever mentioned it again. Does anybody really pay attention anymore to car alarms going off in parking lots, or have they just become part of our daily background noise? And does anyone actually send for police when they see those cardboard "send for police" dashboard heat shields put in the front windshields of cars? Here we are, almost 8 years after Opryland closed, and there are still big green signs on Interstate highways all around Nashville, pointing the way to "Opryland". Hasn't someone told the highway sign-makers that Opryland no longer exists? When I was in college, I worked part time as a Fuller Brush Man. Actually, I was the delivery man for a real Fuller Brush man, but occasionally took orders as well. I don't even know if Fuller Brush still does door to door sales the way they used to. 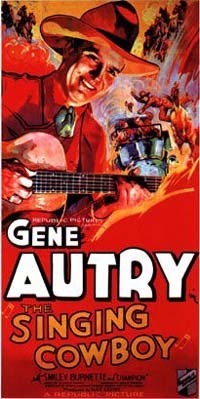 If you've never seen the movie "GRAND CANYON", rent it tonight and thank me later (as Larry King might say). But beware, the language is quite strong.... not for kids!! Suzie Bogguss has the most crystal clear voice in all of country music. Why she isn't constantly at the top of the record charts is baffling to me. I keep wondering, at what point in the aging process do people no longer avoid revealing their age, and find great satisfaction in telling how old they are? It seems to me most really old people enjoy telling exactly how old they are. Have you noticed how people, when their car breaks down on the side of the highway, will open the hood and check the oil level? The oil level is rarely the problem, but it's the only thing most of us non-mechanics know how to do. I found an old audio tape that a friend and I made when we were 14 or 15 years old, and the big question we were pondering on the tape was whether Elvis Presley or Jerry Lee Lewis would ultimately be the bigger star. And, why in the world doesn't the city of Nashville decorate the Shelby Street Bridge in colorful holiday lights during the holidays? It's already beautiful, but what an attraction that would be! There are two birthdays in my life to celebrate this weekend. My two youngest daughters..... my babies..... were born on adjacent dates. Darcy was born on December 10th, and McKensie on December 11th. And, no, they're not twins. 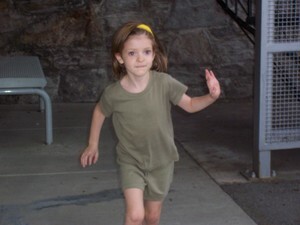 For 25 years, Darcy was my youngest of three -- then suddenly, the day after she turned 25, she became the second youngest of four. That's right.... I have kids spanning two generations. McKensie and Darcy were born at the same hospital, on the same floor, with some of the same nurses there for both births . No doubt, they thought I was there the second time for the birth of a grandchild. But no, I was experiencing a "later in life" surprise..... and a wonderful surprise it continues to be every day. To become a father again, well into my 50's, has turned out to be one of life's greatest gifts. And here's a little bonus from these two beauties. Darcy offers a hint of what McKensie might be like 25 years from now..... and McKensie often stirs up vivid recollections of what Darcy was like 25 years ago. Now there's something you parents who have your kids in a cluster never experience. Anyhow, McKensie has been busy planning this weekend's big 6th birthday party, while Darcy's already planning her wedding that takes place next year. Those are certainly important events in the world of daughters and dads. When McKensie celebrates on Saturday with her little friends, there among them will be big sister Darcy, in the unique position to see things from two points of view -- that of the kids, and that of the grownups. There's another sister as well..... Jennifer..... she's 17 months older than Darcy, and she won't be able to attend because she's at home with our two grandchildren. She's shown here with our granddaughter Elouise. Also not attending is big brother Stephen, who (amazingly) is 32 years older than his youngest sister. Does anybody have a calculator (or a rocking chair) handy? So, Happy Birthdays girls, and I leave you with two quotations.... and I think you'll know why I chose each of them. "Certain is it that there is no kind of affection so purely angelic as of a father and daughter. In love to our wives there is desire; to our sons, ambition; but to our daughters there is something which there are no words to express." "Sooner or later we all discover that the important moments in life are not the advertised ones, not the birthdays, the graduations, the weddings, not the great goals achieved. The real milestones are less prepossessing. They come in the door of memory unannounced, stray dogs that amble in, sniff around a bit and simply never leave. Our lives are measured by these." Last Friday, I accompanied my wife on a tour of the Decorators' Show House...... and here's my story. The Show House was an old Nashville estate, nestled on a hill off Post Road. The Show House has become a local tradition, sponsored by the Junior League of Nashville.... and they always do an impressive job. Every year, they pick a different house -- and an army of designers, decorators, landscapers, artists and others, transform the home into something magical. And every year, Karen makes sure I don't miss it. This time, after coming to terms with the fact that I was paying $40 for the two of us to walk through a house, I relaxed - ready to enjoy the tour. Seeing all the designs and furnishings gave me lots to think about..... not anything I'm apt to actually do, but lots to think about. Then, about 20 minutes into our tour, a strange awareness began to settle over me. Everybody there was a woman. With the exception of my own reflection in the mirrors, every single face I saw was that of a woman..... everybody. From the time we entered the front door, until we left through the back, and even through the big tent called Holiday Marketplace, I never saw another man..... not one. I was beginning to experience the kind of clumsy discomfort a man feels when he accidentally enters the lady's room in a public place. Had I missed something in the rules? Had I somehow slipped into the Twilight Zone? As we walked back to the front of the house, I was struck by the spectacular view from the house. A small river runs through the property, about 90 yards down from the house. 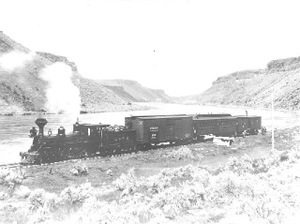 And about 75 yards beyond the river there's a train track, and -- as though on cue -- a freight train came rumbling by. And then.... there.... standing in the driveway, I saw another man. Could it be? Would he turn and reveal the face of Rod Serling? No, it was just a guy, watching the train and the river. And while I have no way of knowing for sure, I believe I detected in his face a sense of relief when he saw me.... a man..... standing there. When I first started this little website column back in the summer, my wife Karen's only request was that I not use the word "blog" in the title. She feels "blog" is a less-than-pleasant sounding word. When your wife makes such an observation, you pay attention, so I passed on such titles as "Bloggings", or "Blogatorium", or "Blogateer". Of course, 'blog' is now a real, honest to goodness word. It's in all the dictionaries. As every person in the world now knows, "blog" was created as a contraction of the words "web log". If you didn't know that...... well, now everybody in the world knows it. Anyhow, my first title choice for these essays was "Markings"...... but the late Dag Hammarskjold wrote a famous book by that title years ago --- a wonderful book if you haven't read it --- so I passed on that. I considered "Jottings", but that sounded like doodling or drawings. In the end, I settled on "Dan Miller's Notebook". It's simple....... and some might say that fits me perfectly. Tonight, Tom Brokaw ends 21 years as principal anchor of NBC Nightly News. I'll miss him being there. When big things happen in the country or the world..... good or bad..... he's the one I want to hear it from. I've had the pleasure of Tom's company three or four times over the years, and I've found him to be a warm, generous man. The first time we met was around 1980, before he became anchor of Nightly News. He was a panelist for the Vanderbilt Impact Symposium, and I was the moderator. But my favorite time spent with Tom Brokaw was in 1984. I flew to New York to tape, what they call, cross promotional announcements with Tom and several others news people at NBC. You've probably seen these types of spots. A local news anchor sitting next to the network anchor, on the big national news desk, talking glowingly about each other's news product. It's an interesting experience. Dozens of anchors from cities all over, gathered at NBC, in a room filled with donuts and pastries, coffee and soft drinks -- each waiting to be shuffled into a studio for his or her three minutes next to the big guy. and, what's most fun, you mix and mingle with news people from other cities. There's almost always someone there you worked with at some stop along the way. Anyhow, after the taping was done, I was headed to the elevators - tape in hand - ready to take the long walk back to my hotel. 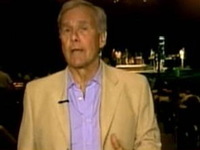 Out of the corner of my eye I could see Tom Brokaw, standing in the hallway -- ambushed by a young man (I assume one of the visiting anchors) who just kept asking question after question, followed by long-winded observations -- and Brokaw just couldn't break away. Tom looked flustered. He didn't want to be unkind, but he obviously wanted to be on his way. Suddenly, we made eye contact, and to my surprise he called out, "Dan, hold the elevator", and came running over. On the elevator, we mused about how easy it is to get trapped in well intentioned conversation, and how difficult it is to graciously break away. On the ground floor, we walked out of 30 Rock, onto Fifth Avenue, and proceeded to walk six blocks through Manhattan, talking about the news, about his wife's toy business, about the characters on the streets of New York, about the weather, and about Nashville.... a city Tom is quite fond of. Now, I promise you.... I gave him every opportunity to go his own way, fearing any minute he would call out to someone else to "hold the elevator"..... but he never did. Finally, I turned to go to my hotel, said goodbye, and remember thinking, "he's a nice, regular guy." And that, I think, has been his strength on television. He is a really nice, regular guy. He's grounded, he knows what he's doing, and he makes it look easy. 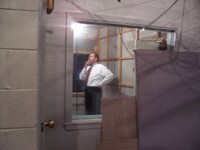 Tune in tonight at 5:30 for Tom's final newscast. As he signs off, and walks away, it will be done with class. I'm pretty sure many fellow journalists and news executives won't agree with me on this one.... but I'll say it anyway. Whenever a terrible crime or other emergency happens, TV newsrooms -- and no doubt radio stations and newspapers as well -- immediately try to obtain tapes of the 9-1-1 emergency call. Such calls are often made by a distraught person in a state of fear, if not hysteria. Personally, I am filled with doubt as to whether such 9-1-1 calls should be broadcast. Now, if the person who made the call gives permission for it to be broadcast on TV, that's a whole different situation. I know, I know.... those calls are legally part of the public record, so the media has full access to them. So maybe it's all a question of simple consideration for people's feelings and privacy. I've made only one 9-1-1 call in my life. It was many years ago, to report a guy with a gun who was in a heated and dangerous argument with someone near my home. Fortunately, that confrontation ended peacefully, with a little assist from police officers. But I can tell you this...... when I made the call, my adrenalin was pumping and it was not the kind of phone call I'd like to hear broadcast on TV or radio. In fact -- and this is the clincher -- if I'd thought my call would be publicly broadcast, I can't say with absolute certainty that I would have even made the call. And that's what troubles me. Wouldn't it be sad if someone about to call 9-1-1, in the heat of a life and death emergency, paused for even a moment, thinking - "maybe I shouldn't make this call, because it'll be heard all over TV in the days ahead." You might not be bothered by this, but some people are. Some folks are so timid and afraid of embarrassing exposure that it could easily prevent them from making a potentially life saving call. To hear someone crying or screaming - frantic with unbridled emotion - is not something I think should be made readily available for public consumption just because we can. Remember when the judge wouldn't release Dale Earnhardt's autopsy pictures to the media? Remember the reason? Because it would be an unfair invasion of the family's privacy and comfort, even though those photos were public records. Well, to me, the same applies to these terrifying emergency calls. It was 11 years ago when Angie Dickinson pulled one of the great TV snubs of all time. NBC was doing a big revival of "This Is Your Life", a show that had been extremely popular in the 1950's. Many of you will remember that show. Ralph Edwards was the original host. 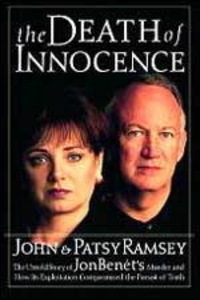 It was one of TV's earliest "reality" shows. By hook, crook, and simple deception, family members and friends would lure an unsuspecting celebrity or notable person to the TV studio, telling them they were attending a function of some sort. Sometimes the "person to be honored" might be part of the studio audience, or they might have been told they were to honor someone else. It was what the producers called the "sting". Then, out of nowhere, the host would make the surprise announcement - "John Doe (or whoever), this is your life!". That would be followed by a parade of people who'd been a part of the honoree's life or career, telling stories, and often providing pictures. They'd even have mystery voices from far in the person's past..... an old teacher, or coach, or childhood pal. It was all quite sappy, and usually quite entertaining. Well, on a pleasant California evening in November of 1993, Angie Dickinson arrived at NBC, thinking she was there to tape a surprise tribute to Brian De Palma. He had directed her in the movie thriller Dressed To Kill. But suddenly the tables turned, and the host said... "Angie Dickinson, this is your life!" Angie shot back, for all the audience to hear - "(Expletive) No! I won't do it! Not on your life!" And folks, this was the mother of all expletives.... the one Ralphie got the bar of soap in his mouth for using in the movie A Christmas Story. Angie screamed at her agents, and asked whether Burt Reynolds (her close friend) was among the celebrities waiting in the wings. He was -- and she said anyone who really knew her would know she'd never go for such a thing. Angie left the premises. Those there to honor her were sent home. 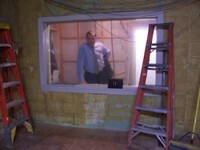 NBC explained to the audience that the taping would not proceed. 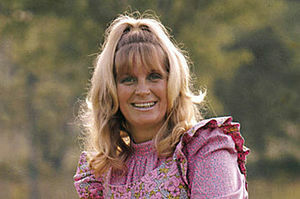 Angie later berated her friends and agents for taking part in the conspiracy. And, I'm told, all the tapes of the encounter were erased - never to be seen again. OK, so Angie might have over-reacted a bit..... but since I'm one who has a fear of surprise parties, I always felt she made a strong statement on my behalf, and all others who don't want to be surprised. For me, her stock went through the roof that day. Finally, John was fed up and he yelled at the parrot. The parrot yelled back. John shook the parrot, and the parrot got angrier and even ruder. John, in depression, threw up his hand, grabbed the bird and put him in the freezer. Fearing he'd hurt the parrot, John quickly opened the door to the freezer. Hope you have a wonderful Thanksgiving weekend..... I'll be writing again here on Monday. I couldn't decide whether to call today's blog an Addendum (which is singular), or an Addenda (which is plural)..... so I decided to just go with "Some Things I Left Out Earlier". Pepper Hampton of Nashville, after reading my essay last week on the goodness of Ladybugs, sent me an email, reminding me of the main reason we shouldn't hurt Ladybugs. They are, Pepper pointed out, Tennessee's “Official State Insect”. Uhhhhhhh... I knew that. Pepper is certainly right..... but the esteemed state designation of the Ladybug is shared with the Firefly. That's right.... we have two official state insects, the Ladybug and the Lightning bug. But here's the rub. If it's true we shouldn't harm Ladybugs because they're our state insect, shouldn't the same apply to the lightning bugs? Yet I recall Oak Ridge, and some other places, actually making appeals through the media (Channel 4 included) for people to collect lightning bugs..... freeze them!!.... and sell them by the bucket for scientific research. That's right.... dead state insects by the buckets full. Or would it be bucket fulls? And for whatever it's worth, we actually have a third Official State Insect as well. The Honeybee has been designated the State Agricultural Insect. It seems Tennessee is a state crawling with highly honored insects. The State Bird -- the Mockingbird -- considered one of the finest singers among North American birds, making it perfect for Tennessee. The State Animal -- the Raccoon -- though some might argue that since George Jones is called the Possum, that might have been a more fitting choice. The State Reptile -- the box turtle. The State Butterfly -- the Zebra Swallowtail. Bill Clinton's Presidential Center opens today in Arkansas to much ado, and that has me thinking about Clinton, and other American presidents as well. Whenever I hear any past president mentioned, there's usually some fact, quote, deed, rumor, or legend, that immediately pops into mind. It might not be anything significant, or even true. And it probably has nothing to do with their effectiveness as president. Consider George Washington. The first thing that comes to my mind (and to everybody else I asked) is chopping down the cherry tree. There's also the legend that he couldn't tell a lie..... and that he tossed a coin across the Potomac. I doubt those things are true. Mention Harry S Truman, and I think of the little sign on his desk reading "the buck stops here".... or perhaps the trivial fact that there's no 'period' after the S in his name. Dwight Eisenhower immediately brings to mind, for me, Augusta and golf. He came there so often when I was growing up that we Augustans hardly even noticed. Conversely, I often think about Eisenhower when I'm stuck in traffic on the Interstate Highway system, which was started during his administration. Jimmy Carter always brings to mind "Billy Beer" and peanuts. Of course, I think about the sterling example he sets for how "former presidents" ought to be... active, involved and inspiring. Mention Lyndon Johnson, and, oddly, I think about how he picked up his dog by the ears. Fortunately, I then recall the Civil Rights Act of 1964, which came about on his watch. The name Ronald Reagan makes me recall his breathy "...Well..." when he'd start a sentence. And the chills he gave us all with those powerful words, "Mr. Gorbechev, tear down this wall". When I hear the name Gerald Ford, sorry, but I think of a man falling down (thanks in large part to comedian Chevy Chase). 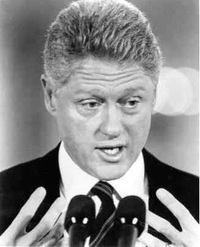 And just when I thought Bill Clinton would always conjure up thoughts of his troublesome indiscretions, and the deception that followed, along comes the "Clinton syndrome". In the days after Clinton's close call with clogged arteries, hospitals all around the country reported an epidemic of worried, middle-aged men scurrying in to get their own hearts and arteries checked. It even changed the way some doctors do business. They now send patients directly to angiograms without doing the usual treadmill stress tests first. That's because Clinton reportedly had normal stress tests despite his severe blockages. Even private heart scan centers, which use a type of x-ray, have been seeing a big boost in business. And those expensive tests are generally paid for by the patients themselves. This type of public reaction has happened before. When comic actor John Candy suddenly died in 1994 at age 43, the same rush to get checked happened. And it did in 2002 when 33-year old major league pitcher Darryl Kile died. But few things get as much publicity and press coverage as when they happen to a former president. So maybe, someday, the mention of Bill Clinton will spark thoughts of those motivated by the "Clinton syndrome" to pop into mind, replacing that other stuff.. This picture could've been taken on any given day. 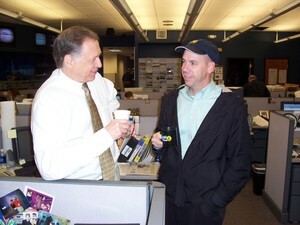 Terry Bulger and me, in the middle of our newsroom, enjoying a cup of hot coffee. More on that a few lines down. Years ago, a photographer here at Channel 4 drank a lot of coffee. I won't use his name because I hear he's been ill recently..... I'll just call him Maxwell Folger. Every time I saw Max he was drinking coffee. It's still difficult to form a mental image of Max without a styrofoam cup in his hand. One day I asked him, "Max, how many cups of coffee do you drink in a day?" He thought for a minute, counting on his fingers, and finally said, "thirty-five". Now, to me, that seems like a lot. He told me the reason he drank so much is because the TV station offered free coffee in the commissary. It's not good coffee.... it's not even bad coffee.... it just sort of resembles coffee.... but, hey, it's free! So I drink it (generously flavored with hazelnut creamer). Most days at work, I'll have 4 or 5 cups - but when I'm not working, even one cup is rare. A recurring discussion Terry Bulger and I have concerns whether we would drink ANY coffee if we had to pay for it. Like me, Terry drinks very little coffee away from work, but I believe he's closer to being a true "free coffee addict" than I am. He fills his cup a lot - though, from my observations, he seldom actually consumes it. And that's the thing with free coffee drinkers..... we don't feel compelled to consume it. Sometimes it's simply a "carrying it around" thing..... a prop. But every now and then, great excitement spreads through the hallways of Channel 4, and there is a real reason to drink it to the last drop. It happens when a gourmet coffee distributor shows up and installs a temporary dispenser in the commissary. It's always a trial run. They offer real coffee..... tasty gourmet coffee..... in a variety of flavors and strengths. And IT'S FREE! And for that one day, it's delightful.... lines form at the coffee machine, and we all rave about the taste and aroma. Of course, the distributor is hoping serious coffee drinkers will get spoiled and be willing to pay 30 cents or so for wonderful aromatic brew every day. But when it's time for the reckoning...... would we be willing to pay for such pleasure everyday?.... it's always the same. "No, we'll take the free, hot, brown water over there". The reality is, if they took away the coffee and offered, say, free buttermilk instead, Terry and I would probably be discussing the merits of smooth versus lumpy - as we drank, or at least carried around, our fifth glass of buttermilk that day. What should we do about all these little orange, dotted ladybugs? Seems to me they're taking over the earth. Well, I did a little research. First, they're not ladybugs. They're lady beetles. More precisely, they’re Multicolored Asian lady beetles. And you don't need to do anything. They're good guys. They were purposely introduced into this country years ago to combat aphids. Some people still purchase the little critters to protect their gardens and plants. Aphids, or plant lice, are not good guys..... except maybe to other aphids. The reason we see so many lady beetles..... they've not yet acquired natural enemies to control their numbers. Yes, they do invade our houses and garages.... but they're accidental invaders. They're outdoor insects that become a nuisance when they wander indoors, looking for a place (especially bright colored walls) to ride out the winter. Here's the good news. They don't feed or reproduce inside. They cannot attack the house structure, or furniture, or fabric. They cannot sting or carry any diseases. They don't bite..... well, they might..... and occasionally they might pinch exposed skin..... but they're really tiny and it won't hurt too bad. The bad news is, they sometimes invade your space by the thousands! And if you smash or crush them, they can leave a slimy smear and a distinct odor. In fact, that odor is what keeps predators, such as birds, from eating the lady beetles. So don't smash them on upholstery or wallpaper. They can leave a stain. A vacuum cleaner might be your best weapon. If you want to keep them out of your place, you need to do that in September, before they make their appearance in late October and early November. And that involves sealing all the small cracks around your place where they could get in.... and that ain't easy! "Remember, these beetles are providing a service for us (killing pest aphids) and should not be killed whenever possible. Eventually, the beetle's population will exceed its food supply, or natural enemies may become more abundant, and the populations will crash or reach a lower level without our interference." End quote. Meanwhile, I now consider them to be really tiny, low maintenance "pets". I was discussing with some friends the other day "the best country recordings ever made." Not necessarily the best songs, but the best recordings of country songs. It's amazing how subjective such a list can be. The only constant with everybody seems to be George Jones' recording of "He Stopped Loving Her Today". That's on everybody's list. I planned to list 20 recordings I considered the best, but I couldn't narrow it from 50. My choices are based on four things: the song, the production of the recording, the musical accompaniment, and the performance by the singer. So here's my list.... as of today..... in no particular order. And it could change the next time I'm in the car and hear a great old country song. 8. Family Tradition - Hank Williams Jr.
Well, I just thought of about 20 others, like "Heartbroke" by Ricky Skaggs, "Letting Go" by Suzy Bogguss, and "Everything That Glitters" by Dan Seals.... but I'm keeping it to 50. Today, I'll explain the complicated process I go through to get this little column (blog) posted on the WSMV website. Here's what I do. I type it on the computer, and I send it to the young man pictured here. Then I go get a cup of coffee. 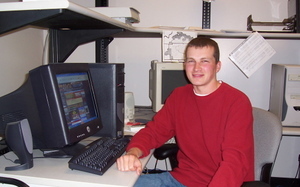 Scott Sutton is the TV station's Website Manager. And today, I'm revealing his secrets. Scott never meant to be a website manager. He has a degree in Broadcast Journalism from the University of Miami. He planned to be a sports reporter, working in front of the camera. After graduation he sent out 20 or 30 audition tapes and resumes. Then - as young people eager for a paycheck are prone to do - he jumped at the first offer he got..... this one..... running our website. It was also near his family in Lafayette. Scott never claimed to be a computer whiz. In fact, he'll admit he took only one computer class in college. "Sort of a Computer 101 thing", he told me. Not to worry. Scott has emerged as one of the premiere computer wizards in the whole Meredith broadcast group, and we're fortunate to have his dedication and ability here at WSMV. His biggest job aggravation, he says, is Dan Miller (that's me) calling in after the column is posted, wanting to change a single word. That usually happens after my wife reads the blog and lets me know that I've used the wrong word, or that something I've written makes no sense. As for the best part of his job, Scott says.... "I have no deadline". That's a rare perk in the news gathering business. Scott is obviously a quick study. He took one typing course his sophomore year in high school and, in his words, "I haven't seen a typewriter since then." I keep telling him computers are a passing fad, and that typewriters will make a big comeback someday. As for me, I know how to type this column, and I've learned how to attach a little picture. Lucky for me, Scott is there to do the technical stuff. The station website is visited by tens of thousands of people every day. Both Scott and I thank you - whoever you are - for being one of them. I often tell my wife that - just once - before I'm too old, I might hop a freight train and have a little adventure. A few years ago I read an article about a prominent doctor who - every year - took two weeks off, and hopped a train to somewhere. His "vacation" was being a railroad bum. His wife didn't like it..... but she tried to understand. It probably all has to do with some deep, mysterious 'yearning' in men that science hasn't even begun to unravel. They're still doing research on why men won't ask for directions. Right now, as I'm typing, I hear a train whistle in the distance. I hear them every night. The other day I was listening to Paul Simon's great song, "A Train In the Distance". There are dozens of websites on the Internet about "train hopping" (almost all strongly urging people not to do it). There's even a website for the National Hobo Association. Have you watched "Sullivan's Travels"? It's about a big time Hollywood director who decides to hop a train, and - in the process - learns great lessons about life. If you haven't seen it, you should rent it. A real classic. Oh well..... I have a wonderful wife who let's me talk about my big "train adventure". And she probably knows - with absolute certainty - I won't do it. In these times of heightened security, it would be difficult and dangerous to hop a train. I'd likely find myself hopping in the back of a police car before I'd ever leave on a train. I projected that I would write a few final thoughts tonight (early Wednesday) about the big winner of the presidential election, but I've elected to go to bed instead. That was my provisional plan. But it's after 2:55 AM, and I'm sleepy. I've heard all I want to hear tonight about provisional ballots, recounts, percentages, lawyers and advisors. In fact, as the night wears on, I'm beginning to fantasize about better ways to elect, or select, our president. I'm thinking about wrestling matches..... free throw shooting contests..... drawing straws..... or perhaps a few rounds of "rock, paper, scissors". Or, how about this.... I saw the champions of a "shouting contest" appearing on Leno not long ago. That might be a fun way to go. Howard Dean and Zell Miller would make a powerful ticket for the Democrats. The Republicans would have to come up with a strong shouter to compete, and Newt Gingrich is retired from politics. Is Chris Matthews a Republican? See what I mean...... it's time for me to go to bed. IS IT REALLY TOO CLOSE TO CALL? I remember thinking election nights weren't fun to watch anymore, because TV networks could project the winner within 15 minutes of the polls closing. Sometimes, in national elections, they could project a winner before the west coast polls even closed. Then came the 2000 election. After two premature declarations of a winner, we all went to bed not knowing who our next president would be. And for a month of bedtimes, we still didn't know who would be president. The 1960 election was a fun one. I remember listening to NBC radio, as they confidently declared Richard Nixon the winner. I believed them, and assumed it was over. But - surprise! - they quietly backed away from that projection, and John F. Kennedy went on to win, with roughly 120,000 more popular votes than Nixon. 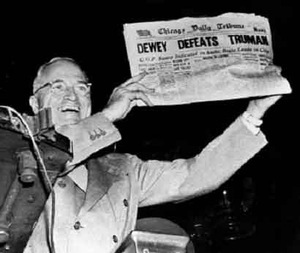 And though I don't personally remember it, we've all seen the pictures of the 1948 election, when the Chicago Daily Tribune printed the headline "Dewey Defeats Truman." I'm sure the newspaper's composing room had set the type for either outcome.... but with vote tallies so late in arriving, they simply published the result the polls clearly indicated would be accurate. The publishers would have done better if they'd based their decision on the Washington Redskins, who had walloped the Cleveland Rams a few days earlier, 59 to 21. For some reason, the Redskins have accurately foretold the outcome of each presidential race since 1936. For 15 straight presidential elections, when the Redskins have lost the last home game before the election, the incumbent party has lost the election. And when the Redskins have won that home game, the incumbent party has remained in the White House. The Redskins lost yesterday to Green Bay, 28 to 14. So, if that interesting little predictor works again, John Kerry will be the winner tomorrow. But it's just a football game. It's probably nothing more than 15 coincidences in a row. Three memorable events in history happened on this date, October 27th.... each involving Cuba.... and I remember two of them. The first happened a few years before I was born. 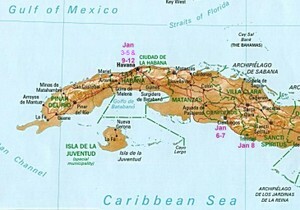 On October 27, 1492, Christopher Columbus discovered Cuba and claimed it for Spain. That's the day Spanish became the official language of the island nation. Almost 500 years later, on October 27, 1962, the Cuban missile crisis ended, after bringing the world frighteningly close to nuclear war. I had been working for only a few months at a small 500 watt radio station in Augusta, Georgia, as a disc jockey and newscaster, while taking college classes. I knew little of international situations..... in fact, looking back, I knew little of anything..... but it was clear to all of us that this was extremely serious business. I recall seeing President Kennedy on television showing reconnaissance pictures of the Soviet nuclear missiles and launch pads in Cuba, photographed by a U2 spy plane. It was a scary and sobering revelation. The odd thing was, the Soviets had done nothing illegal, by international standards. They were responding to the U.S. placing missiles in Britain and Turkey. The Soviets felt they could achieve some sort of parity with our long range missiles by placing medium range missiles in Cuba. So the whole process of getting the Soviets to dismantle the rockets was tricky. Against the advice of some within his administration, Kennedy chose a naval blockade of Cuba, and the stare-down began. No one could predict how Nikita Khrushchev might react. But on this date, 42 years ago, the Soviet Union agreed to remove the missiles, while the U.S. agreed not to invade Cuba, and to remove our missiles from Turkey...... and we all dodged an unthinkable bullet. If you haven't seen the movie "Thirteen Days" with Kevin Costner, rent it tonight. It's a fascinating and chillingly realistic look at just how close we came. Oh.... the third event involving Cuba on October 27th was in 1990. Xavier Cugat died on that day, at the age of 90. The Cuban bandleader probably had more to do with the infusion of Latin music into American pop music than anyone else. He also introduced the world to his 4th wife, Charo. I could probably make some sort of joke about a possible naval blockade, but I'll refrain. ANYBODY GOT CHANGE FOR A MILLION? 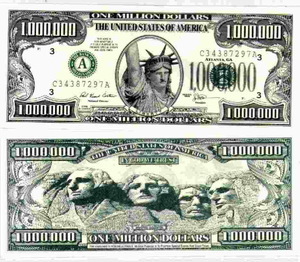 I hope you're not stuck with an old $1,000,000 bill in your wallet... because you can't spend it. 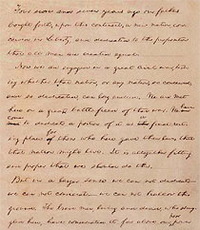 Contrary to popular legend, the U.S. Treasury never produced such a note. So if you swapped, say, ten of your $100,000 bills for one $1,000,000..... you, my friend, got "took". I was told the other day by a knowledgeable coin and money collector, that a $1,000,000 note really had been issued..... but, after a little checking, I learned it's just not true. They DID produce $100,000 notes for a couple of years in the 1930's.... so if you're still carrying around several of those - first, congratulations - and second, rest assured you can still redeem them for full face value. Any money ever issued by the U.S. Treasury..... no matter how old..... is still valid and redeemable at full face value. But also remember this.... really old money is probably worth considerably more to collectors than it's face value. For example, I saw an old $500 note on sale by collector for $900. So, if you have an old $500... before spending it at Taco Bell, take it to a collector instead. Maybe he'll even treat you to a burrito. The Treasury no longer distributes currency in denominations of $500, $1,000, $5,000, or $10,000. A few might still be in circulation, though they haven't been printed since World War II. A $1 bill lasts 18 months; a $5 bill, two years; a $10 bill, three years; $20 bill, four years, and $50's and $100's last nine years. What got me thinking about all of this was a little story last week from Fond du Loc, Wisconsin. Several employees of a Taco Bell called police after someone tried to pay for their meal with two strange looking $5 bills, which alarmed the employees. Turns out the currency was just old. One bill was dated 1963, and the other 1928. Oh, and here's something I learned on my recent trip to Germany. If you have any old German marks, you're out of luck. They've been replaced by the euro.... the grace period is over.... and they're worthless and no longer spendable. I still have 5 marks from an earlier trip to Germany, and I plan on hanging on to them for 50 or 60 years, then seeing what I can get from a old money collector. Mickey Mantle would have turned 73 years old today. He was a true American hero.... not always a role model..... but always a hero. The giddy effect that Mickey Mantle could have on rational middle aged men is not easily explained. But as the first baseball commissioner, Judge Kenesaw Mountain Landis, said: "Every boy builds a shrine to some baseball hero, and before that shrine, a candle always burns." Now, don't be misled. 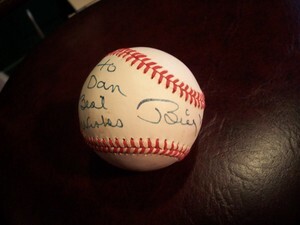 The baseball pictured here is not autographed to me by Mickey Mantle. It's signed by his fellow Yankee Billy Martin..... but it was ALMOST signed by The Mick as well. If only I'd stuck to my guns, it would've had both Mickey's and Billy's signature on it - making it a unique, even valuable, collectable. Within days of Billy Martin autographing the ball, Mickey Mantle was scheduled to appear on the show I was working on in California. I brought the baseball to the studio with the intention of getting Mickey to sign right next to Billy's name. I stood there, within a few feet of Mickey, waiting for the dozens of autograph seekers and picture takers to thin out. This crowd was made up of producers, writers, make-up artists, etc., people who are normally rather nonchalant about show guests. But everyone kept on imposing on Mickey, and I finally backed away, fearing we were all just intruding on his time.... though he didn't really seem to mind. In fact, he seemed to expect it. 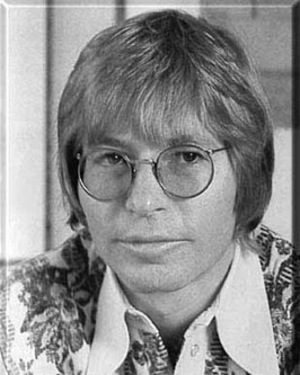 He pictured himself at the pearly gates, met by St. Peter who shook his head and said, "Mick, we checked the record. We know some of what went on. Sorry, we can't let you in. But before you go, God wants to know if you'd sign these six dozen baseballs." Mickey Mantle simply exuded magic. He was the drawl-speaking farm boy from Oklahoma, who became a reluctant legend in his time. Next to Muhammad Ali, I can't think of any athlete whose mere presence had such an impact. 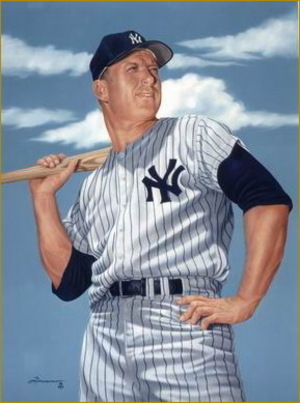 Someone once said, "the name Mickey Mantle represents more than a great baseball player, it represents a state of mind." I should have waited in line a little longer. My 4 day trip to Germany was a good one. How could it not be? My daughter Jennifer and her growing family are beautiful and happy. Just a few sentences down, I'll explain that 2nd picture accompanying this column. 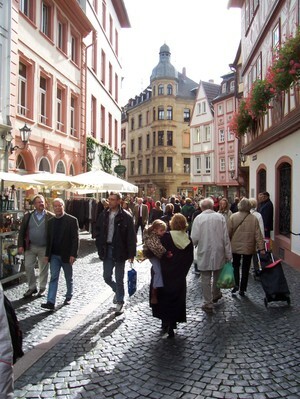 The first picture shows my wife carrying our daughter through the picturesque streets of Mainz. Now, some unscientific personal observations and generalities about Germany. As an American, accustomed to our way of life, I noticed some not-so-subtle differences. By U.S. standards, German stores and businesses remain behind the curve. I saw plenty of old fashioned cash registers and display cases that are, frankly, reminiscent of our country in the 1950's and 60's. Older apartments and buildings in Germany are, as often as not, lacking safety and convenience equipment we take for granted, like smoke detectors and even elevators. I saw no provisions for handicapped or disabled people. On the plus side, the preservation of old buildings and neighborhoods is remarkable. 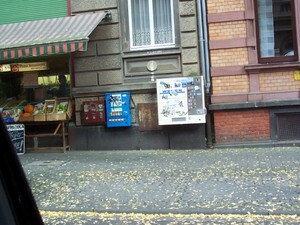 The older sections of Wiesbaden, where my daughter and her family live, are stunningly beautiful. Also, from my observations, there are few people in Germany noticeably overweight. It appears to be a nation of fit and trim citizens. Maybe that's because they climb so many stairs in those elevator-less buildings. It also appears almost everybody there is a smoker. They smoke everywhere, apparently with no restrictions. I never once saw a no-smoking section in a restaurant or building. In fact, while the U.S. has taken great steps to limit access to cigarettes by teenagers and children, there are no such limits in Germany. You'll find cigarette vending machines (the second photo) on street corners in business districts and even in family neighborhoods. Any child with a little cash has unlimited access to cigarettes. Parts of the airport in Frankfurt smelled like an ashtray, with unrestricted smoking everywhere. It reminded me of how public places were in this country before we put limitations on where you can smoke. Coming home to Nashville's airport was like a breath of fresh air, literally. Germany is a beautiful, historic country that's dealt admirably with unhappy circumstances over the years. They've emerged from the horrors of war and misguided leadership to become a progressive nation, whose policy is now aimed at peace, cooperation, and fighting global poverty. Now, if they'd just do something about exposing their children, and my grandchildren, to all that smoke. I just returned from a quick visit with my daughter and beautiful new granddaughter in Germany, so my brain is still readjusting to Nashville time. Actually, it's much easier to adjust after flying home.... and gaining hours.... than arriving in Europe, where I walked around for one full day like those guys in "Night Of the Living Dead". But, around 3:30 this morning, I was up, ready to face the day, feeling "as one" with Bill, Holly, Tim and the rest of our morning crew. Among the events of this trip, my 5 year old daughter got a quick and, she feels, amusing lesson in airport security. But last week, leaving Nashville, was the first time I've had to remove my coat, shoes and belt... then be scanned by the metal detector wand, and THEN patted down by the security guard. I kept thinking a little mood music and candlelight might be next. They never did figure out what kept triggering the alarm. They asked if I'd had artificial hip replacement. I said, "no, not that I recall". As you can imagine, my five year old thoroughly enjoyed watching this whole process, and wanted to know if "...Daddy will be coming with us?" Later though, I must confess, her Mother and I enjoyed watching as German authorities scanned her skinny little 5-year old torso, while she held her arms out to her side. These days, the process of flying.... especially an international flight.... involves literally hours of lining up and being checked, rechecked, and questioned...... but, from what I could see, most people felt the hassle to be worth the sense of security. I know I did. I hope when McKensie is grown, she'll appreciate why we do all of this. Beyond that, I hope she'll experience a time in this world when it's no longer necessary. 1. "I woke up in the middle of the night in a cold sweat. I was dreaming that I was about 45 minutes into the debate, halfway through, and I had no more questions. And I said, 'Gentlemen, I've run out of questions, so please talk among yourselves'." 2. "I would have made the rhythm of 'California Girls' a little better. That is my only regret." He answered, 'Well, we can't let you in unless you identify yourself.' I said, 'Well, hell, I am the governor.' Then the gates swung open. I thought, 'Well, I hope the pearly gates swing open when I get up there to those.'" 4. "I don't want to put some weird, you know, psycho twist on it, like he was pulling me out or anything, but he had a lot to do with me getting out of that car. From the movement I made to unbuckle my belt, to lying on the stretcher, I have no idea what happened." 5. "This is what Mayberry would look like if Aunt Bee had money." 6. "I am thrilled to be the emcee of the National Book Awards ceremony, a big night in the book world, when you get to see distinguished authors feign nonchalance though they're all giddy and sweaty and their hearts are pounding. Someday I hope to feign nonchalance myself." 7. "When I signed my new contract, I felt that the timing was right to plan for my successor, and there is no one more qualified than Conan. Plus, I promised Mavis I would take her out for dinner before I turned 60." 8. "Our lives are more valuable than the insurance companies' profit margins." 9. "When I look at my children, sometimes I wish I remained a virgin." 10. "Where a calculator on the ENIAC is equipped with 18,000 vacuum tubes and weighs 30 tons, computers in the future may have only 1,000 vacuum tubes and perhaps weigh 1-1/2 tons." As I write this, we're still hours away from tonight's final presidential debate.... but I'll go ahead and answer the big question..... "who won?" Every TV host and anchor will ask that question...... so here's the answer in advance: It depends on who they ask. The Bush spinners, without fail, will say Bush won.... while the Kerry people will be equally emphatic that Kerry was the clear winner. In the post-debate polls, a significant percentage of people will say it was a tie. These people are those good Americans known as the "undecideds". They will do exactly what they're supposed to do........ they won't decide. 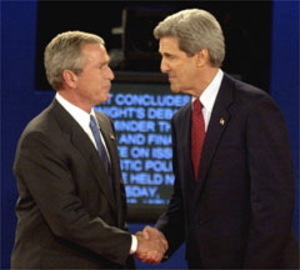 Oh, I'm sure a few of the "undecideds" will declare either Kerry or Bush the winner of this debate.... but I'm betting not many will make a commitment yet, one way or the other, on how they'll vote in November. Why should they? The "undecideds" are the real power players in all of this. Everybody wants to be their friend. If it weren't for the undecideds, there would be no need for these debates. The "decideds" all know how they'll vote, no matter who wins these debates. I'm certain there are some "decideds" pretending to be "undecideds", so they can continue to be courted. It would go against everything they stand for to commit this early. Each candidate is, in a sense, preaching to the choir... Bush to the Republican choir.... Kerry to the Democrat choir.... but both are also trying to reach that choir of people who won't join the other choirs. Sometimes I think it might be more fun, if not more meaningful, to have the candidates take part in a quiz show instead of a debate. Have Alex Trebek host. "Alex, I'll take 'Domestic Issues' for 800." In the end, we'd simply add up the money and know who really won. And we still wouldn't know who'll win in November. I thought the moderator of the second presidential debate, Charles Gibson, had an interesting response to the question... who won the debate? He said he was too involved in his role as moderator.... keeping track of logistics and listening for followups..... and was simply too connected to the whole thing, to form an opinion on who performed best. He just didn't have a clue. I understand that. If you've ever moderated a discussion or debate, or conducted a long form interview for TV or radio, you probably understand as well. Occasionally, after I've completed an interview, someone might ask me how it went - and I have to admit, I'm really not sure. Listening is a key to good interviewing, but no matter how closely you pay attention..... there are often so many technical things going on around you, that it's easy to miss a hidden gem in the answers to your questions. I always hope I don't ask something like: "So what are your plans for the weekend? ", after the person I'm interviewing has just let out a bombshell I've completely missed, like... "....and then I murdered my uncle." The audience often hears, and relishes, words that hardly register with the interviewer. And often, dumb questions will produce unexpected gems. I'll give you an example of, what I thought was, a meaningless, throw-away question that a lot of people obviously appreciated. I was hosting an interview show on TNN in 1992.... interviewing Chet Atkins. I asked Chet, almost as an aside, what kind of guitar strings he preferred. I'm not sure Chet had ever been asked that question during an interview, and he offered a fairly detailed answer about guitar strings. I gave little thought to that particular exchange..... but later, I got calls and letters from guitarists around the country thanking me. They were fascinated to hear Chet Atkins talk about guitar strings. I asked the question.... truthfully, not having a clue so many people would find that bit of information enlightening. Here's a quick and inexpensive way to relax..... try pretending. My 5-year old McKensie does it all the time. Now, don't get me wrong...... I still do some "grownup pretending". Or, in a restaurant, I'll pretend to really be interested in the "specials" the server is enthusiastically telling me about, even when I know exactly what I'm gonna order. As for McKensie, most days, after spending hours in the 'real world' of pre-school, she comes home eager to spend time "pretending". Before she started pre-school, she had the whole day to conjure up imaginary scenarios for herself, her dolls, and others. Now she has to take advantage of limited pretend time. 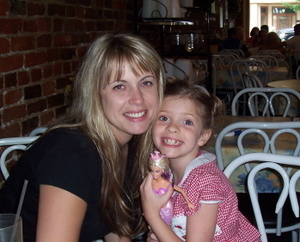 I notice that McKensie will often assign her mother a specific role in her pretending. But she's not always so eager for me to play along..... primarily because I tend to "break character" too often. I watch and listen to the earnest conversations taking place between dolls and toys and hermit crabs..... and I know I can never again really go inside that world. That world belongs exclusively to a child's imagination. It is far beyond the comprehension of a mere grownup. I recall a radio show, half a century ago, called "Let's Pretend". It was broadcast on Saturday mornings on CBS radio. The cast of 'pretenders" would re-enact classic fairy tales and original stories. It was a wonderful show. Too bad young kids today don't often listen to such things, where the mind's eye is used to add pictures to the stories they hear. Oh, I just thought of something I pretended as a child, and still do today. Sometimes I'll pretend to be asleep when I'm awake..... but that's the extent of my pretending. OK, every now and then I'm Gene Autry, and my little motor scooter is Champion..... but that's about it. THE CMA'S..... IF THEY CAN MAKE IT THERE! So they're moving the CMA Awards Show to New York City for one year. What does that say about Nashville, the home of country music? 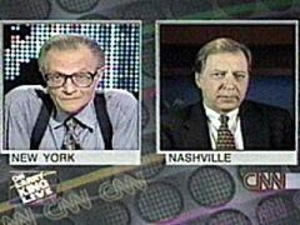 I've never understood why a nationwide telecast originating in New York would have any more exposure than a nationwide telecast originating in Nashville. The same affiliated stations carry the show, at the same time. Are Americans more apt to watch a show simply because it's being staged in New York? I can't imagine why. And most of the seats in New York will be filled with the same music folks who'd be filling the seats here in Nashville. So what's the difference? And if it's being done just to expose the people of New York to the pleasures of country music, I can think of some other things that should be moved as well. Why not move the New Orleans Jazz and Heritage Festival to New York? And perhaps the Mardi Gras as well. I don't think New Yorkers are exposed to enough jazz. And New Orleans is a smaller TV market than even Nashville. And how about moving the Nashville Independent Film Festival to Los Angeles? We'd get better exposure with "the right people" out there. Even the Cannes Film Festival. Nobody wants to travel all the way to France. Move it to somewhere like Austin, Texas for a year or two. And the Master's Tournament, played down in little 'ol Augusta, Georgia. That's a fairly small TV market..... let's move that tournament to Atlanta. The Talladega 500.... that place is much too small for such a big event. They should move that race to Detroit for a year or two..... after all, Detroit's the Motor City. And why not bring Charleston's Spoleto Festival here to Nashville? We would all like to learn more about spoletos.... I love them.... I order them all the time with sour cream and chives. Oh well.... next thing you know they'll be moving London Bridge to Lake Havasu City, Arizona! I see lists all the time of top selling books and music.... the top grossing movies.... and the highest paid athletes..... so, what about prescription drugs? Prescriptions obviously play a significant role in our quests for health and happiness. We spend tens of billions of dollars on them every year, and there are few people past the age of, say, 40 who don't have some sort of doctor's prescription. "Only in America - do drugstores make the sick walk all the way to the back of the store to get their prescriptions - while healthy people can buy cigarettes at the front to the store." Last week, amid all the news about Vioxx, I found this list from Associated Press of the most successful prescription drugs in this country. In 2003, Vioxx was #20 on the list, with sales totaling $1.8 billion - and that's just in the United States - so you can imagine the meetings that took place in the board rooms of Merck prior to it's big decision. The shame of it is, Vioxx - in addition to it's main purpose of easing the pain of arthritis - has been seen as a possible cancer-preventer. But when it was found to double the risk of heart attack and stroke, it came off the shelves. Now Merck faces the likelihood of lawsuits that could have an immeasurable impact on the company. Obviously, you can look for Vioxx to fall off the list next year. The only thing I'm able to read into this list is that we Americans have high cholesterol and a lot of heartburn. Oh, and we spend a lot on prescriptions. Hummm. THE LOTTERY... HITTING THE BIG ONE! I heard someone say, "Money can't buy you happiness, but it can buy you a yacht big enough to pull up right alongside it." Maybe, but I believe there are far less expensive ways to find happiness. 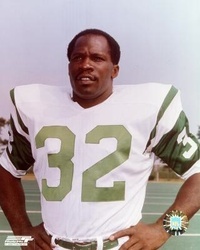 Melvin Rhodes found a way. He did it by becoming a part time biscuit-maker at McDonald's. Melvin had been successful in the restaurant business for years. He owned restaurants in North Carolina, Florida and Tennessee. After his wife died, he became interested in funeral homes and, with some partners, bought a funeral home in Clinton, Tennessee, and ran it for 12 years. Then, when he was about 70 years old, he wanted to do some traveling, so he decided to sell the businesses, and get a part time job. That's when Melvin went back to his first love, the restaurant business. He became a biscuit-maker at McDonald's there in Clinton. He did that for 5 years, making biscuits part time, and traveling in his free time. Happy as a lark. At 74 years old, Melvin hit the lottery. $80 million! He had purchased a powerball ticket in Kentucky. He took the cash option.... a bit more than $42 million. Melvin became a big contributor to the Ronald McDonald House .... he donated $100,000 to the University of Tennessee .... he helped start a home for battered women in East Tennessee, and gave to many others. His son said Melvin had always given people the shirt off his back, now he could just do it on a bigger scale. Melvin died this past weekend in Maryville at 78, four years after winning the lottery. It was the end of the line for this World War II veteran, who had found happiness 5 years before winning the lottery, by simply making biscuits at McDonald's. When this story came across the wires yesterday, I heard some of the young people joking about how it's always "old people" who win the big jackpots, and how young people would have more time to enjoy the money. They're not quite old enough yet to understand what "the big one" really is. My wife walked outdoors last night and saw that big full Autumn moon. She said it was magical. And to wake up every morning with good health, and people you care about, and who care about you..... that's the big one! My daughter Darcy called to let us know she adopted a dog from the Nashville Humane Association, or as my younger daughter calls it, the Who-Man Association. So we're excited about welcoming "Archie" to the family. And that got me thinking about dogs. We know they have a remarkable sense of smell..... possibly 100,000 times more powerful than humans. That might explain why dogs like to stick their heads out of car windows. It's not the breeze they relish... it's the quickly changing potpourri of smells. Dogs enjoy them all. I'm usually limited to the occasional dead skunk, or exhaust fumes from the bus in front of me. My wife Karen is 100% certain that our 15-year old black lab Pippa knew we were going to have a baby before we even had a clue. The old dog (who's no longer with us) would lay her head on Karen's lap, sniff at her tummy, and make unusual little sounds. A couple of weeks later, an obstetrician confirmed the dog's diagnosis. Last week on our newscasts, we reported on a remarkable study outlined in the British Medical Journal that demonstrated how dogs..... with no special training.... could detect cancer in the urine of test subjects at a rate three times higher than random selecting. A doctor at Cambridge University in England said it's plausible because people with cancer shed abnormal proteins in their urine. And it's not a new idea. Two London dermatologists suspected the same thing 15 years ago, after a woman's collie-doberman mix constantly sniffed a mole on a woman's leg and even tried to bite it off. The doctors checked it and found it was a malignant melanoma. They caught it early enough to save the woman's life. But there's something we didn't report about the study in England..... and it's intriguing. Here's the rest of the story. One of the people used in the dog research was tested beforehand, and deemed 'cancer free'. That patient's cancer-free urine would be used for comparison purposes. But all the dogs, without exception, identified that participant's urine as a cancer case. The doctors assumed the dogs had failed that part of the test. But more tests were conducted, and - amazingly - that person was found to have a life-threatening kidney tumor. All the lab work had missed it. I get the feeling dogs might turn out to be even better friends than we imagined. 1. "When boys are throwing rocks at a frog, it may seem like good fun to the boys, but to the frog, it's serious business." 2. "What's the Wall Street Journal? Is that good?" 3. "The problem with you baby doll is, you think you're special." 4. "Please, I just want to be a little old lady now, and not be all controversial and not be bashed and called crazy and laughed at when I open my mouth to sing or speak." 5. "It's really not that bad. The worst thing in Florida is to be without the AC." 6. "Thanks to Homeland Security for saving us from Cat Stevens!" 7. "Happiness is like a cat. If you try to coax it, it will avoid you. It will never come. But if you pay no attention to it and go about your business, you'll find it rubbing against your legs and jumping into your lap. So forget pursuing happiness. Pin your hopes on work, on family, on learning, on knowing, on loving. Forget pursuing happiness, pursue these other things, and with luck happiness will come." I couldn't avoid it.... really. Heading home along White Bridge Road, there was a car to my left, and the curb to my right. All of a sudden, it appeared. There was a slight sound, and I felt fairly certain I had hit it. With a heaviness in my chest, I circled the block to come back and have a look. Sure enough, there it was, dead in the road. The whole scenario hung on my mind. I told my wife I felt just awful. As a tribute to the dead possum (as we call them here in the south), I did a little research. Possums look like some sort of rat, but - in fact - they're North America's only marsupial mammal. The female carries and nurses her young until they are two or three months old, then they are carried on her back another 1 or 2 months. Did you know opossums lived during the age of dinosaurs? Fossil remains have been found from 70 million years ago. And imagine this..... they can have a "honeymoon" (so to speak), and 13 days later give birth. And they'll eat almost anything.... snails, slugs, cat food, dog food, people food, even other opossums who have become "one with the road". They're very gentle, and even though they might growl when frightened, they prefer to avoid all confrontation and wish to be left alone. Oh, and they rarely live longer than a year in our environment, especially along White Bridge Road. If you find an injured opossum, or you find abandoned babies, there are some things you can do. 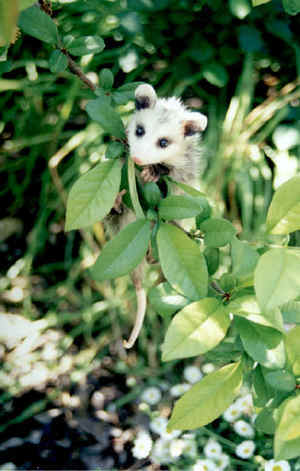 I encourage you to visit the website of The Opossum Society of the United States. Tell them Dan sent you. You can become a member for only $25 a year. And they have a wonderful Gift catalog where you can order beautiful T-shirts for only $16. I'm beginning to feel much better. Oprah Winfrey came to Fort Campbell on Monday, and some of the hundreds of women who turned out said it was a "blessing". I've heard my sister say the same thing.... "Oprah is a blessing to the world". When Oprah walks into a room, people react as if they're in the presence of royalty, or even deity. There are TV consultants who pontificate on what's good or bad about various shows and people on TV. One of them, while analyzing Oprah's show, said "Oprah has no weaknesses..... None." That's astounding, because these guys always find something negative to say. I decided to ask some people I trust...... What's the deal with Oprah? What makes her so special? ".....there's no one like her. I love her as the 'best friend' I can laugh with and cry with. She doesn't preach, and she has a sense of humor." "Her emotions are real. She shares and she empathizes with, what seems, a 'guided' understanding of people. Over the years Oprah has allowed her audience to join her journey in learning how to live a life." ".....because she cares and she is curious. It is the combination of the two that makes it magical." "....absolute honesty. She never tries to pretend she doesn't have a gazillion dollars.... she acknowledges it, and generously helps people better themselves when she can." "Besides, there's always a chance she'll give you a car." As many of you know, Oprah was a 'news anchor' here in Nashville years ago. Being a news anchor myself, I can tell you we anchors like to be thoroughly familiar with the words and stories we're reading, mainly so we don't stumble. But Oprah told me something very revealing a few years ago. She said - doing the news, she never liked to read over her news script, or even be familiar with it, prior to delivering it on TV...... she liked to read it cold. Oprah said - quote - "I liked to hear what I was reading for the first time, along with everybody else, so I could react naturally." Perhaps those were the early signs of Oprah's magic. What a great weekend. Perfect weather, and nothing much to complain about. Well, there is the "instant replay issue". The Titans game reinforced my belief that reviewing calls on the field via instant replay is a problem. Too often, it stops the flow and momentum of the game. And seemingly, as often as not, the issue is still not resolved convincingly. Perhaps the league should set up a "higher authority official".... sort of an Appeals Court Referee in the press box who could override the lowly game referee's ruling on the field. Each game, both teams would be allowed one appeal to the Appeals Referee. That would stop play for another 15 or 20 minutes while the tape was checked in the press box. 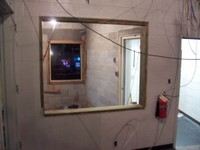 Think of the added revenue for the concession stands. Then, if the ruling still wasn't to the liking of a coach...... there'd be one more option. Every season, each team would have one or two appeals to an NFL Supreme Review Court. In such a case, the game would be suspended, to be resumed at a later date in the season, after the NFL Supreme Review Court issued it's final ruling on the play in question. Sure it might lengthen the season, but it would give injured players a chance to heal, and at least we might get these calls right. In yesterday's Titans - Colts game, if such an appeal could've been made, I'm certain that when the game resumed later this winter, our Titans would have the ball on the one yard line, with twenty-odd seconds on the clock. Yes, they'd still be behind by two touchdowns - but in the NFL you never know what can happen. By the way, congratulations to UT and TSU on their "miracle" wins. And though Vandy lost, it was an exciting, productive overtime game that gives me hope for the rest of the season.